Since 2007, researchers studying animals from whales and pandas to birds and frogs have gathered at the Cornell Lab of Ornithology, 10 at a time and 2–3 times a year. What they have in common is an interest in natural sounds—and the problem of analyzing hundreds or even thousands of hours of recordings to better understand their study species. They come to the Cornell Lab for an intensive one-week course offered by our Bioacoustics Research Program (BRP), called the Sound Analysis Workshop. On the agenda is in-depth instruction in using two sophisticated software packages developed by BRP. Known as Raven and XBAT, the programs are ideal for analyzing huge bodies of data from natural sound recordings, but require some skill to use. To date, more than 100 researchers from 21 countries have attended the workshops. For years, the Lab’s Macaulay Library has offered a Sound Recording Workshop to train people in collecting high-quality recordings in the field. But for researchers, getting sounds on tape is only half the battle. They still need to extract those sounds from background noise, and then measure them precisely enough to allow comparisons to be made. 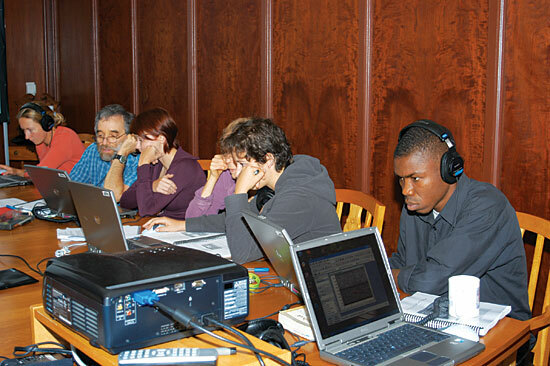 The Sound Analysis Workshop teaches these sound spectrographic analysis techniques. Instructors including senior BRP scientific staff, BRP programmers, Cornell Lab scientists, and guest speakers use Raven and XBAT in the lecture room throughout the week. The constant exposure familiarizes participants with using the full capabilities of Raven and introduces them to XBAT. Among scientists who have attended workshops are Kasey Yturralde of Northern Arizona University, who studies how bark beetles communicate; Andre Guerreiro da Silva, a Portuguese researcher analyzing the whistles of bottlenose dolphins; Justin Perry, who studies mountain frogs for the Australian Commonwealth Scientific and Industrial Research Organisation; Julio Santiago, working to conserve the critically endangered Puerto Rican Parrot; and Jennifer Keating of California State University-San Marcos, who is studying giant pandas. Past participants remark on the usefulness of the workshop format, noting that the small class size offers an excellent level of personal attention from instructors. The interactive nature of the lessons promotes learning, and working alongside the other participants allows them to expand their network of contacts at the Cornell Lab and elsewhere in the expanding field of bioacoustics. The next Sound Analysis Workshop will happen this September. One of the attendees is Luke Halpin, a graduate student from Simon Fraser University, who hopes to use sound analysis to help conserve seabirds in Canada. Halpin works on the Haida Gwaii islands off British Columbia, breeding grounds for 1.5 million nesting seabirds, including half of the world’s Ancient Murrelets. Norway and black rats, which were introduced after European settlement, have caused populations of various native seabirds to decline or become extirpated. Since 2009, Parks Canada and the Haida Nation have worked together to eradicate rats on various islands in Gwaii Haanas National Park Reserve and Haida Heritage Site. To understand whether this helps seabirds rebuild their numbers, Halpin and his colleagues plan to use sound to monitor colonies. They are using autonomous recording units at 14 colonies throughout the archipelago. These programmable devices can be left in the field to record for a month at a time, providing a continuous aural postcard of life at the colony between visits by the researchers. Using his Sound Analysis Workshop training to measure when and where the birds call, Halpin plans to turn those hours of ambient sound into estimates of how the numbers of Ancient Murrelets and other seabirds change over time. Halpin hopes recordings of target species at well-studied populations will provide baseline data to help him estimate populations on unsurveyed islands. As rats are removed from other islands, Halpin hopes that his analyses will provide valuable information about how rapidly seabird populations recover. Many students attending the Sound Analysis Workshop fund themselves through grants and scholarships. When funds are available, BRP occasionally offers its own scholarships to encourage participants from developing countries whose projects align with the Lab’s conservation mission. Find more about the workshops here. Luke Halpin’s project has been made possible by generous support from the Leverhulme Trust and Parks Canada.